Finally! A comfortable solution for the two camera shooter. No more fumbling or having to set your bodies on the ground. 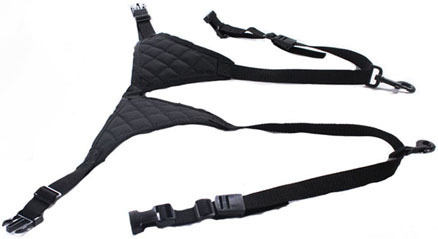 The Camera Slinger's design does not require the use of a cross strap, making it both female and wardrobe friendly. The Ergonomic design support system is made to support the weight of your cameras on the stronger part of your back, the unique bi-lateral binding takes the stress off your shoulders and spine. Your back will love you! See the manufacturer site here. • Strap and Mounting hardware to attach it to your camera bodies.